The most important design feature of the lower furling unit is its bearings. For long term, low friction operation, the bearings must be high quality and very well sealed. Most units have some type of sealed bearings. The bearing assembly in the lower unit of Reef-Rite has three bearings, with two seals at the top and two more at the bottom of the bearings assembly. This sturdy design provides extra protection for the bearings. In the unlikely event that a bearing should fail, it can be replaced using readily available parts. Another innovation of the Reef-Rite system is the use of a mechanical pawl. 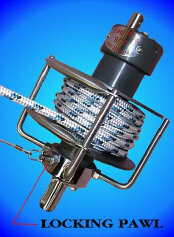 When engaged, the pawl only allows the furler to rotate in one direction. As a result, the load is on the pawl when a sail is furled, and not on the furling line. The solid locking action of the pawl means improved sailing performance under furled conditions. A second benefit is improved safety. With normal furling systems there is a continuous load on the furling line that be quite heavy when the headsail is partially furled. If the furling line becomes loose or breaks, the sail is suddenly released. This usually happens when you want it the least. The locking pawl prevents such unintended unfurling, yet it is simple to release it when you want to unwind more sail. To disengage the pawl, you simply flip a small, conveniently mounted Hyfield lever. This lever controls a small wire led forward to the furler lower unit, that runs right alongside the furler line.